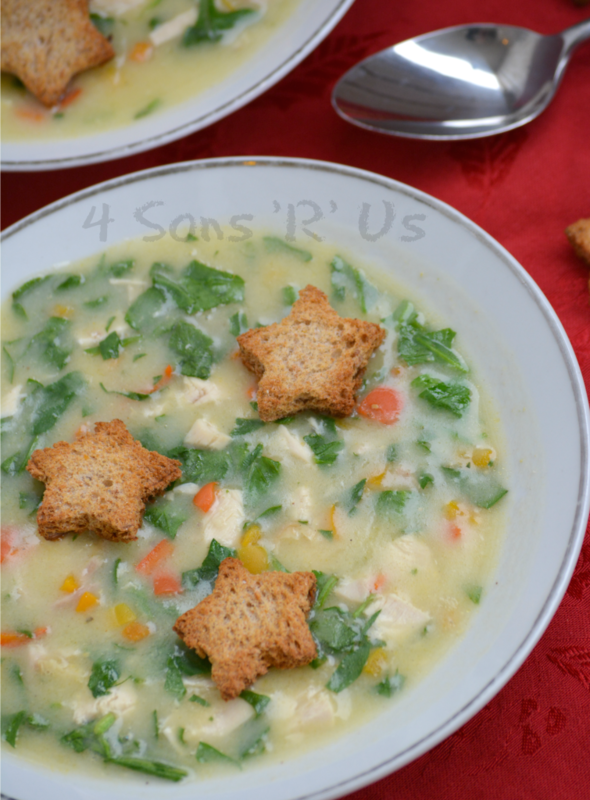 A festive chicken soup that’s perfect for the holiday season, this Christmas Confetti Chicken Soup features green baby spinach. It’s speckled with colorful sweet peppers and topped with fun star-shaped croutons, making it a yummy, festive bowl full of cheer. If you know me at ALL, you know I’ve been moaning and groaning about how warm it’s been so far during Winter. It’s a crime that should be punishable given that it’s only days away from Christmas Eve. Lucky for us, the cold weather has arrived just in time to herald the Season in. Those furry boots, puffy coats, hats, mittens, scarves that were all sitting on the corner hooks unused and looking forlorn? Raising our hand for a household that’s proudly bundling up now. I may complain in the summer months about the heat, but unlike virtually everyone else I know– hasn’t ever happened yet, and I’ve yet to meet a blustery day head on that’s made me cry ‘uncle’. With everything else getting on board, it means it’s time for us to ramp up our in-house festivities that get us all in the mood. There can never be enough anticipation leading up to the big day and the real reason for it all, right?? Pairing that with a hungry tummy’s cold weather bff was just a match made in foodie Heaven. 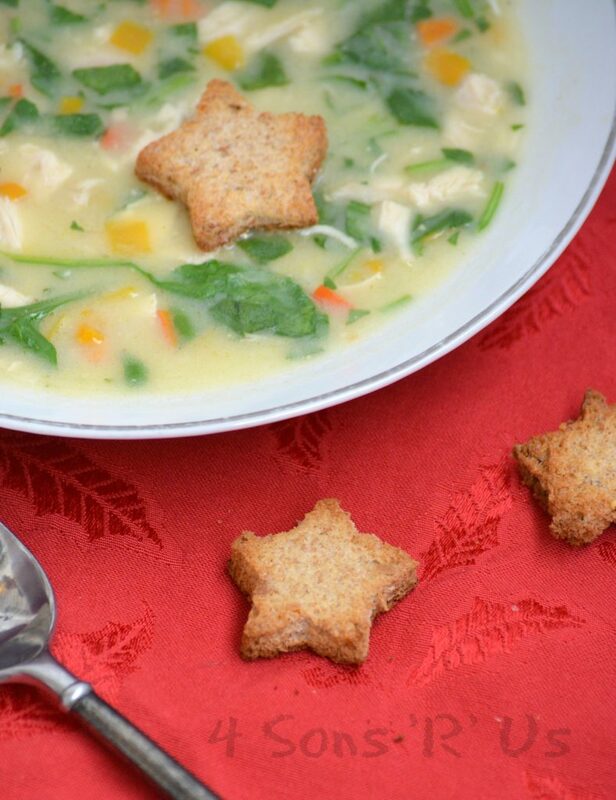 Our Christmas Confetti Chicken Soup was the perfect main course to pair with Gingerbread House decorating for dessert. It’s fun, it’s merry, and it’s quick and easy enough to put even the most harried cook in a good mood. 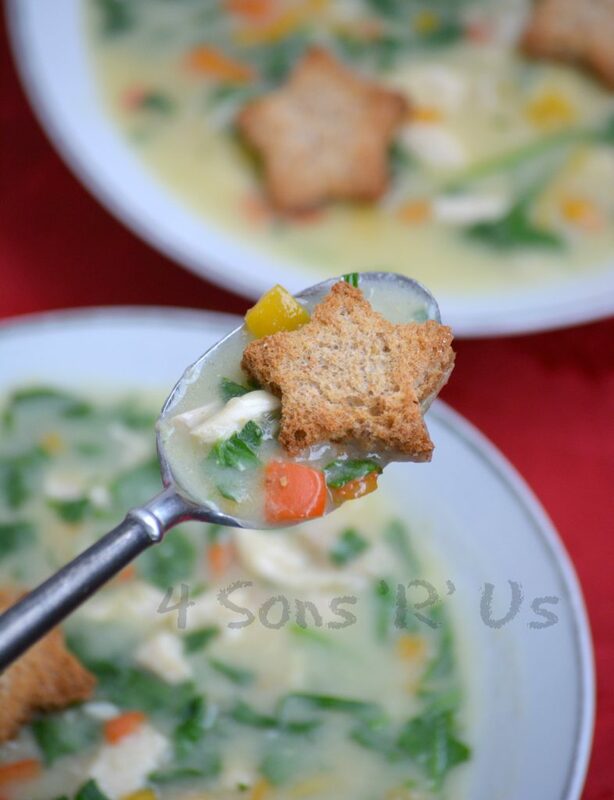 A thick and creamy chicken broth base is studded with pops of Christmas color from healthy chopped spinach, pops of bright ‘ornament’-like colors from sweet bell peppers, chunks of rotisserie chicken, and topped with toasted star-shaped croutons. It’s a little bit of Christmas in every bowl- that’s will warm you right on up with every bite. It’d even thaw out The Grinch. Or the grinch-es in your own life. 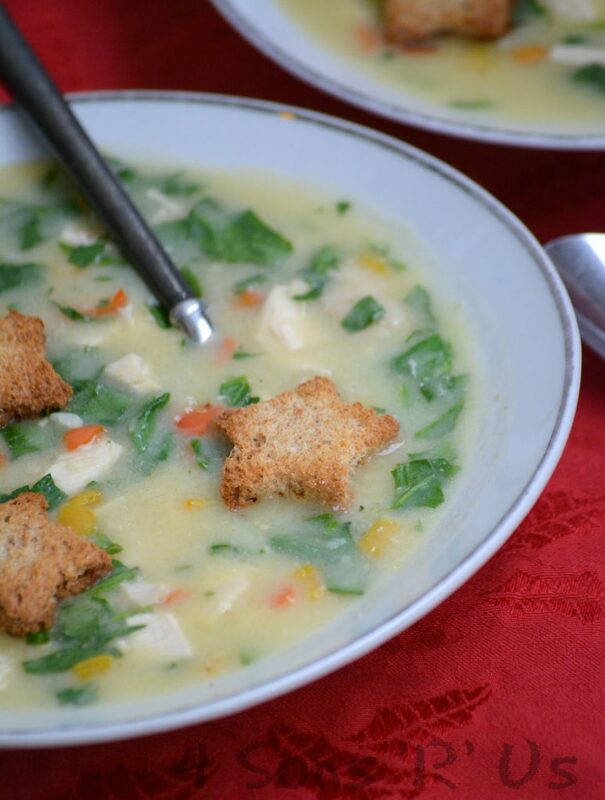 A hearty, festive soup that'll keep you in the holiday mood by warming you up from the inside out, in decorative style. Melt the butter and olive oil together in the bottom of a dutch oven, or similar heavy pot, over medium low heat. Stir in the chopped peppers and the four. Stirring constantly, let the mixture cook for 3-5 minutes, or until the veggies are somewhat softened and the flour 'taste' has cooked out. To the thick, clumpy, amber colored mixture, stir in the broth followed by the cream / cup at a time. Allow the soup to continue cooking, stirring occasionally, until the mixture's hot, bubbly, and thickened, about ten minutes. Stir in the the spinach, chicken and nutmeg. Salt and pepper to taste. Let the soup heat through, without ever letting it actually reach a boil. Use a one inch star shaped cookie cutter to cut out four-five stars from each slice of bread, Discard the excess or save it for stuffing or meatloaf. Spread the croutons out on a baking sheet and lightly, spray with non-stick cooking spray, and sprinkle with a little onion/garlic powder, if desired. Bake at 350 degrees for 6- minutes depending on how golden brown you want them. Let the croutons cool completely before using. Ladle into bowls and serve warm, topped with star croutons. 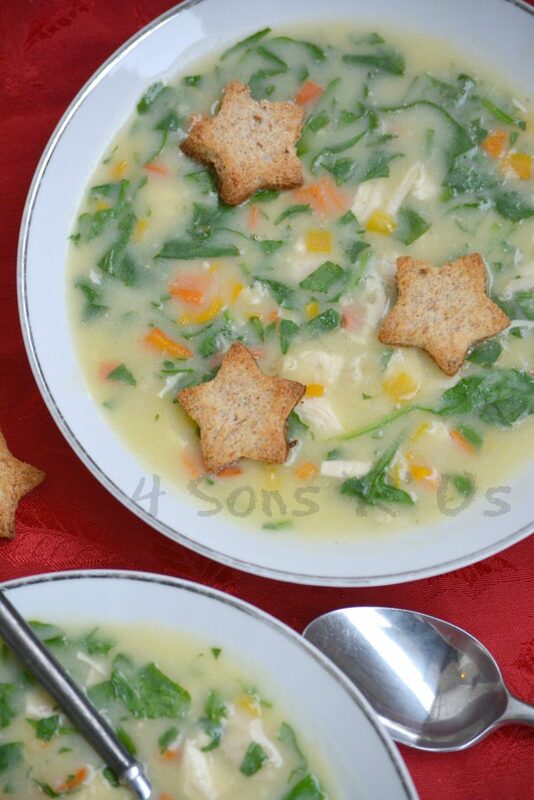 I love the idea of those star croutons, and the soup sounds tasty too. We’ve got a cold snap here too so were on soup tonight as well – always good! Thanks for sharing with Fiesta Friday.